The Canadian National Exhibition includes lots of entertainment with the price ($18) of admission, including a slew of concerts at its five different stages. One local promoter, however, thinks the musical lineup is too homogenous. "This year I was excited to check out the CNE," writes D.W. Waterson in an open letter to the Ex. "I went onto your website to see what day I should go - that usually revolves around the music selections. Last year, a couple of friends of mine pointed out that the line up was incredibly male dominated and had only one female act so I was very hopeful to see some changes. Unfortunately, nothing has changed," she continues. 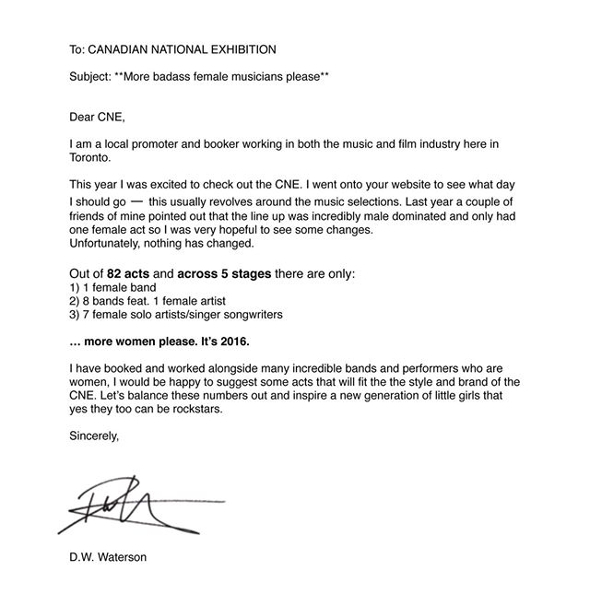 Waterson points out that there's only a small percentage of female musicians performing at the Ex this year, but the CNE's general manager Virginia Ludy takes a difference approach. "I disagree with the comments made in this individual's letter. We have over 1,000 performers here at the CNE, many of whom are women," she tells us, noting how many of the other performances - such as the ice show and water skiing show - include many women-identified artists and athletes. "I am concerned when we have a promoter, you know a promoter who would have a financial interest in booking acts, sending a letter like this. That to me, you know, is a little bit self-serving," says Ludy. She explains that the CNE spends nearly a year working with talent agencies and going to conferences and showcases in order to build a musical lineup that's suitable for its broad audience. And, it mostly comes down to who's touring in a given summer. Gender, she says, isn't a factor. "We're just looking for the best talent we can get," she says. "Male or female, we don't care." It's not the first time these concerns have been raised about the CNE's musical programming, though it's not alone in being criticized for a lack of diversity. The Toronto Urban Roots Fest (TURF), which runs from September 16 to 18, also came under fire when it debuted a mostly male lineup in March. What do you think of the CNE's music lineup? Weigh in via the comments.